The Folger is a leader in Shakespeare education, reaching more than two million teachers and students each year through in-person workshops, lesson plans, webinars, online field trips, and the best-selling Folger Editions of Shakespeare’s plays. In 2016 we brought the First Folio and our love of teaching, learning, and language to all 50 states, Washington D.C., and Puerto Rico. Folger Education developed materials on Shakespeare's language and the First Folio for teacher workshops and family programs, DC. To help host sites connect with their visitors, Folger Education also prepared a docent guide that included an exhibition overview, facts about the First Folio and the printing process, and frequent visitor questions. Shakespeare is one of the greatest storytellers of all time. His work connects millions to powerful language, themes, and ideas that touch us every day. And he is the most commonly taught author in American schools. Join us in 2016 as we bring Shakespeare’s transforming text alive, starting with his First Folio. How can a connection to the First Folio enhance your discovery and understanding of Shakespeare? How can it illuminate Shakespeare in your classroom? Historically –The First Folio contains 18 of Shakespeare's plays that had never been printed before, therefore guaranteeing the survival of Macbeth, Julius Caesar, Twelfth Night, and more. It also groups the plays for the first time into comedies, histories, and tragedies, and includes the Droeshout portrait of Shakespeare, generally considered one of the few authentic images because the First Folio was put together by two actors in his company. Pedagogically –Studying the First Folio opens up important and intriguing questions about Shakespeare’s texts for you and your students. At the Folger Shakespeare Library, our passion for teaching and learning Shakespeare is boundless. For four decades, our national and local programs and resources have supported teachers in all kinds of schools and students at all ability levels. Follow the links below to learn more about the many resources available to you and your students in 2016 and beyond. At the heart of every Folger learning resource is our philosophy of teaching and learning and the highly effective Folger approach, which engages students in active reading, speaking, listening, and writing so that they develop rich literacy - and a sense of ownership in the language. Our teacher-created teaching modules apply that approach to Shakespeare’s works, offering teachers dynamic ways to approach these complex texts. These modules integrate active (and painless) close reading, primary source documents, textual studies, and strategies for adapting and assessing learning. Our overview of Shakespeare's works includes information and images for every play, perfect for in-class activities or for self-directed learning. Students can also find out more about Shakespeare on the Folger website, including his life and what theater was like in his day. Shakespeare: Subject to Change, brought to you by a partnership between the Folger and the cable industry. Use this website to explore with your class how Shakespeare’s plays have been transformed through performance and the printing of the text. You can also find ideas for classroom activities and additional digital resources. Find additional Folger resources that can be used both inside and outside of the classroom. In 2016, working with the 52 tour sites, school districts, and the English-Speaking Union, Folger Education provided full-day Professional Learning Days and two-day Teacher Intensives across the country on Shakespeare's language, the First Folio, Hamlet, and more. In July 2016, twenty-five middle and high school teachers from around the United States worked with scholars, theater professionals, and mentor teachers at the Teaching Shakespeare Institute, funded by the National Endowment for the Humanities. This flagship program of Folger Education, established in 1984, immerses teachers in the very best of the Folger and equips them to teach Shakespeare in a way that impacts student learning and consistently transforms teacher practice. 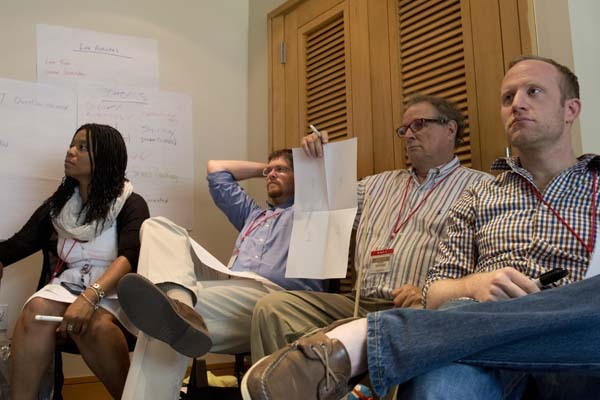 The theme for the 2016 institute was America’s Shakespeare, with deep dives into Othello, The Tempest, and The Merchant of Venice—in particular, their connections to American history and culture. Folger Education also developed three online Master Classes: one-hour interactive professional development sessions, done in partnership with Alabama Public Television, streamed from the Folger Shakespeare Library. In 2016, participants in Master Classes on Hamlet, Othello, and Julius Caesar interacted with scholars, actors, and other teachers to expand their knowledge and appreciation of Shakespeare’s works. Join our teacher email community to receive updates, invitations, and classroom resources.